Jets Week 1 starting QB Josh McCown played sparingly, but couldn’t avoid an injury scare in the preseason finale for the Jets, while fellow QB Christian Hackenberg connected with TE Austin Seferian-Jenkins for New York’s lone touchdown. The Hack-ASJ touchdown combined with three Jets field goals would be enough to give New York a 16-10 victory over the Dane Evans-led Philadelphia Eagles. With that, we give you our PFF exclusive takeaways from the contest for each team. Hackenberg showed the innacuracy that’s plagued him throughout his career. Hackenberg only saw pressure on five of his 25 dropbacks and yet, was 10-of-20 on those passes. McGuire was the lone bright spot on a Jets offense that struggled to hold the point of attack. He forced four missed tackles on just five carries despite his offensive line often getting pushed into his lap. Williams played just 25 snaps but left his mark in coverage. Targeted twice, he allowed just one catch for just one yard while also adding a pass deflection. A lowly 56.3 passer rating was surrendered into his coverage. Jones was another bright spot in a Jets secondary that shut down the Eagles passing attack. He saw four targets, allowed just 21 yards on three reception and had an interception. Quarterbacks targeting him had a 46.9 passer rating. The highest-graded player in the game did not allow a pressure over 29 pass blocking snaps. Thomas was dominant in the run game as well (86.5 run block grade). While he may have dropped a pass, he collected the most yards after contact of all the Eagles running backs. 32 of his 46 yards came after contact and he forced a missed tackle as well. 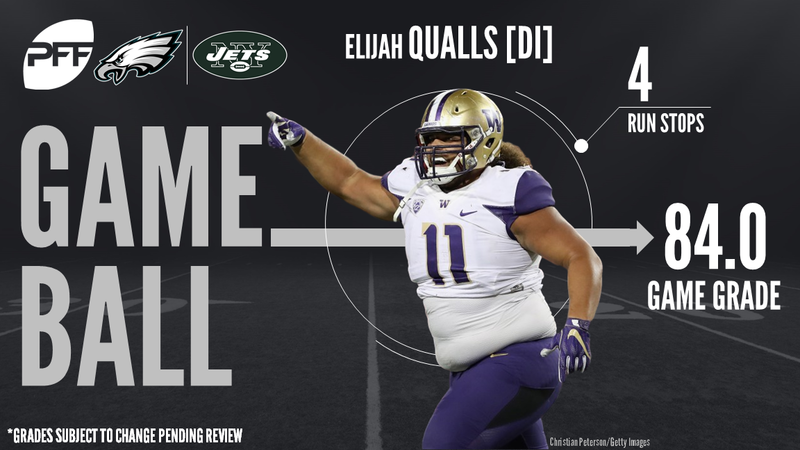 A constant disruption in the New York backfield, Qualls was excellent as his 84.0 grade indidcates. On 44 total snaps, he collected four run stops (18.2 run stop percentage) and a sack and hurry when rushing the passer. Walker played a team-high 52 defensive snaps and affectd every facet of the game. He had two run stops and led Eagles linebackers with a 9.1 run stop percentage. He also only allowed four receiving yards on two targets.